Indeed. Evidently BC is way more corrupt then Quebec. Quebec has task forces that investigate organized crime. BC doesn't. In BC every time a police task force finds organized crime, a government body disbands the police task force. could be the Quebec politicians know the difference between right and wrong. In B.C. its all about, families first, and B.C. is open for business. They just don't say what type of families or what type of business. It can't be "normal" families because B.C. has had the highest rate of child poverty for the last 12 yrs or so. Must be some other sort of family. If we're open for business, you have to ask what type of business because Christy and her lieberals put out more money to mining companies than they take in. Christy and her lieberals take in more in post secondary tuition fees than corporate taxes and she takes in more in medical premiums than in corporate taxes. Now in Quebec, they don't hold records for having high child poverty rates, they don't charge medical premiums. 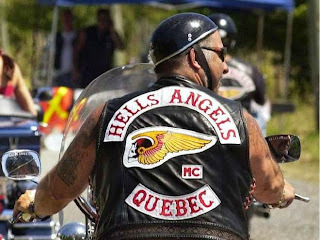 perhaps its just that in Quebec they know the difference between right and wrong and the B.C. Lieberals might be some what impaired in that area. One does still wonder about that money going through casinos...............must work for someone, we just don't think its the taxpayers of the province. "Smuggler’s messages reveal how drugs easily pass through Vancouver’s port." PART TWO OF A SPECIAL INVESTIGATION INTO THE VANCOUVER WATERFRONT. It is funny looking at these old fools with their "patches" and gang uniform.....like the Fonz and the Falcons. It reminds me of the blathering. fools in Donnie Bracso, all sucking up, worried about clothing, proper gang vernacular, and licking the big bosses nut sack in hopes of being noticed. I'd have to agree, some of those boys are a tad old to be playing dress up. On the other hand, if you don't have anything else going for you, it might be the best they can do.